This is my very favorite bread in the whole world. I'm not sure how this love affair started, but it's grown into something I need to indulge in at least weekly. I even keep the baby ciabattas in the freezer to use for Ezra's lunches (turkey and pepperoni on ciabatta, or turkey and spinach leaves). I usually have at least one loaf in the freezer for when I want to make garlic bread to go with spaghetti. It's good just as it is, or with butter, or as the bread for a breakfast sandwich. I got the recipe from Cook's Illustrated, and I'm glad it was during my trial online subscription because I got to watch the video, which helped me visualize what I needed to do with this dough, and what to expect with the consistency. Perhaps if I get proficient at this blogging thing, I'll be able to post more detailed pics or videos of how to make this. For now, you need to know, by the time the dough leaves the bowl, it is very sticky, and very blobby. I can't think of a better word. It almost seems to have a life of its own, which it very may well have due to all of the yeast growth in it. Be sure to use King Arthur Unbleached All-Purpose Flour. I think anything else will only bring you disappointment and will kill your desire to try again. It's worth the extra $2 a bag. Really. Trust me. If you want to make this bread, you need two tools for sure: a stand mixer with a dough hook and a baking stone. I'm not sure how you would kneed this without a mixer, and the stone is what gives it the crisp, brown, chewy crust. 1. FOR THE BIGA: Combine flour, yeast, and water in medium bowl and stir with wooden spoon until uniform mass forms, about 1 minute. Cover bowl tightly with plastic wrap and let stand at room temperature (about 70 degrees) overnight (at least 8 hours and up to 24 hours). 3. Spray rubber spatula or bowl scraper with nonstick cooking spray; fold partially risen dough over itself by gently lifting and folding edge of dough toward middle. Turn bowl 90 degrees; fold again. Turn bowl and fold dough six more times (total of eight turns). Cover with plastic wrap and let rise for 30 minutes. Repeat folding, replace plastic wrap, and let rise until doubled in volume, about 30 minutes longer. Meanwhile, adjust oven rack to lower-middle position, place baking stone on rack, and heat oven to 450 degrees at least 30 minutes before baking. 4. Cut two 12- by 6-inch pieces of parchment paper and liberally dust with flour. Transfer dough to liberally floured counter, being careful not to deflate completely. Liberally flour top of dough and divide in half. Turn 1 piece of dough so cut side is facing up and dust with flour. With well-floured hands, press dough into rough 12- by 6-inch shape. Fold shorter sides of dough toward center, overlapping them like business letter to form 7- by 4-inch loaf. Repeat with second dough piece. Gently transfer each loaf seam-side down to parchment sheets, dust with flour, and cover with plastic wrap. 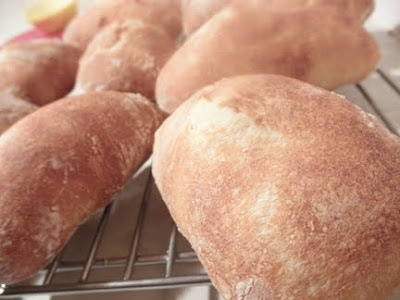 Let loaves sit at room temperature for 30 minutes (surfaces of loaves will develop small bubbles). 5. 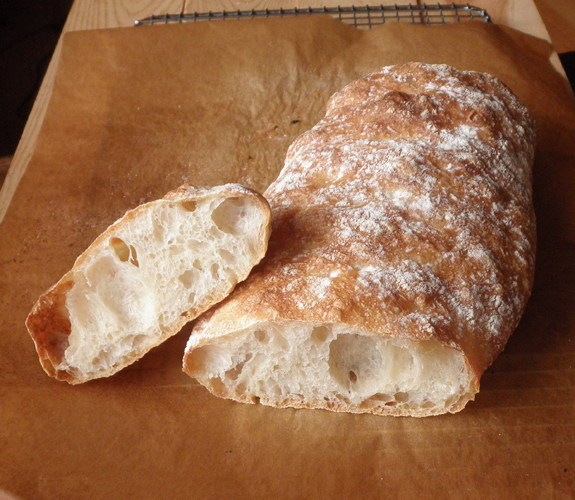 Slide parchment with loaves onto inverted, rimmed baking sheet or pizza peel. Using floured fingertips, evenly poke entire surface of each loaf to form 10- by 6-inch rectangle; spray loaves lightly with water. Carefully slide parchment with loaves onto baking stone using jerking motion. Bake at 450 degrees, spraying loaves with water twice more during first 5 minutes of baking time, until crust is deep golden brown and instant-read thermometer inserted into centers of loaves registers 210 degrees, 22 to 27 minutes. Transfer to wire rack, discard parchment, and cool loaves to room temperature, about 1 hour, before slicing and serving.